White Line Disease is also known as Seedy Toe, ONC, Stall Rot, Hollow Foot, and Wall Thrush. White Line Disease is a hoof wall invasion of common organisms in the environment. All horses are exposed. The medial (middle) hoof wall is the structure affected by White Line Disease. These organisms, both bacterial and fungal, require a nutrient-rich environment that is lacking oxygen to flourish. The outer hoof wall is more resistant to invasion due to its higher density and exposure to environmental oxygen compared to the lower density and lack of oxygen in the middle hoof wall. The third section of hoof wall, the inner hoof wall, is more resistant to invasion due to the proximity of live tissue in this area. The live tissue is not only oxygen rich, thereby inhibiting these opportunist anaerobic organisms, but also has infection fighting abilities. Although a horse kept in a well-managed facility can develop White Line Disease without a clear cause, many cases have mechanical, environmental or nutritional contributing factors. Trauma to the hoof capsule often creates bruising and bleeding. The damaged and leaking blood vessels create a good food source for the “hoof – eating” microbes. Other predisposing factors include a prior occurrence of an abscess or laminitis in which the hoof wall becomes full of holes and crevices, nail holes or hoof cracks allowing organisms to gain access, and high moisture environments which tend to soften the foot and allow the bacterial and fungal organisms an easier entrance into the hoof. Excessive selenium supplementation predisposes horses to White Line Disease. Sulfur is required to build the strong cross links necessary for healthy hoof horn, however excess selenium substitutes in place of sulfur creating weak hoof structure. The empty spaces create an environment conducive for the invasion of the bacterial and fungal organisms associated with White Line Disease. Another nutrition-related contributing factor to White Line Disease is excessive bran in the horse’s diet. Bran is the high fiber product of grain processing (grain hulls). Whether from wheat, rice, oats or other grains, bran contains phytates. Phytates block the absorption of calcium predisposing the horse to a calcium deficiency and other mineral imbalances. Calcium is important in providing the “glue” for cellular adhesion in the hoof tissue. Therefore hoof wall quality deteriorates with calcium deficiency. Calcium deficiency is often a result of diets high in bran and results in weak, crumbly hoof horn. The poor hoof wall quality creates holes and defects that allow the microbes associated with White Line Disease to penetrate. It is also worthwhile to note that either an excess or deficiency of Vitamin A can result in poor hoof quality resulting in a microbial invasion. The medial (middle) hoof wall is the structure first affected. The initial stages are non-painful. 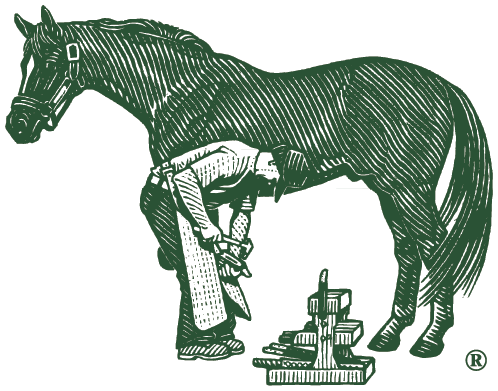 Often the farrier is the first to detect white line disease during a routine trimming or shoeing procedure. Irregularity or thickening of the “white line” on the solar surface of the hoof is usually detectable, often with a dry, chalky material accumulating at the white line on the solar surface. The farrier may notice abnormal percussion in areas of the hoof wall. The hoof wall may be dished inward (concave) opposite of the affected areas and the hoof wall may bulge above the affected areas. As the hoof wall becomes increasingly hollow the outer hoof wall begins to break away. If the horse is shod, nail holes can appear darkened from previous shoeing, and the hoof wall develops less “nail holding” ability. Lameness develops in the advanced stages. Although proper nutrition creates a denser hoof wall that is more resistant to White Line Disease, applying a topical product that utilizes a blend of ingredients known to have antimicrobial properties is an important step. Iodine and tea tree oil are examples of ingredients with these properties. Effective products are available with a sticky clay-like consistency which pack easily and stay in place within existing wall cracks, wall defects, old nail holes, and hoof wall separations for extended periods of time. Do not use topical products that prevent oxygen from passing through the hoof wall. Avoid remedies containing caustic chemicals such as bleach, copper sulfate, grease, motor oil, pine tar, formaldehyde, acetone, and turpentine. A good rule of thumb would be to avoid preparations that you would not want in contact with your own skin. If the White Line Disease is extensive, hoof wall resection will allow oxygen to gain access to affected areas, thereby destroying the harmful hoof eating microbes that thrive in low oxygen environments. Properly balanced nutrition strengthens the sole and hoof wall, thereby reducing the likelihood or severity of white line disease. The prevention of white line disease is most effective when a quality hoof supplement is utilized in combination with packing any existing hoof defects with a safe and effective topical hoof product containing ingredients known to combat microbes. A liquid hoof dressing that protects against excessively wet or dry conditions. Its non-caustic formulation helps maintain healthy hooves while supporting hoof wall elasticity. A non-irritating, easy to handle and sticky clay that easily packs and remains in place within wall cracks, wall defects, old nail holes, hoof wall separations and sulcus of the frog. A hoof supplement that provides nutrients that enable horses to build strong connective tissue proteins important for healthy hoof structure and growth.